The 50th Annual Seniors Tournament is coming up! The event is hosted by AMF Eastbrook Lanes. The Seniors Tournament is open to all senior sanctioned bowlers of the Greater Grand Rapids USBC. The tournament is separated into two age groups, and as well as separated into Mens and Womens groups. The age groups are 55 – 65 years, and 65+ years. Four squads are available, each starting at 11am. Squad dates are December 5, 6, 11, and 12. Note that December 11 is a Friday! $20 entry. Full event details and entry form available here. The 53rd Annual 700 Tournament with Optional 800 is just around the corner. This years event is taking place at Park Center Lanes, December 5, 6, 12, and 13. The 700 ( and optional 800 ) Club Tournaments are open to all sanctioned bowlers in West Michigan that have bowled a sanctioned 700 ( 800 for optional ) series. Walk-ins are available ($5 charge) provide space is available. Get full event details and entry form here. A scheduling conflict with the originally scheduled Women’s Budweiser Open (at Northfield Lanes) has resulted in a change of venue. The tournament will now be held at Paragon Lanes. Same time, same format. The entry form has been updated to reflect this change. Congratulations to Richard Ebel Jr. and Randy Hudson Sr. who claimed victory at the 2015 Officers Jamboree. Richard and Randy combined for a 1,471 handicap score, besting the field of 42 teams by over 50 pins. This years jamboree was held October 17th at Fairlanes. The League Officers Jamboree tournament is held each fall, and is open to all Officers of all Certified leagues in the Greater Grand Rapids USBC. 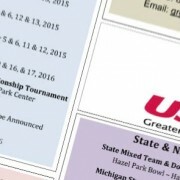 The Calendar of Events for the 2015-2016 season is now available. You can find the PDF conveniently in the upper right hand section of the website. Tournament pages are being updated to reflect. The Greater Grand Rapids League Officers Jamboree tournament will be Saturday, October 17 at Fairlanes. Open to all Officers of all Certified leagues in the Greater Grand Rapids USBC. Entries limited to 4 bowlers from a league. Did you know that USBC has a mobile app? The BOWL.com mobile app is a great way for USBC members to access their statistics, the latest news and more from their smartphone. 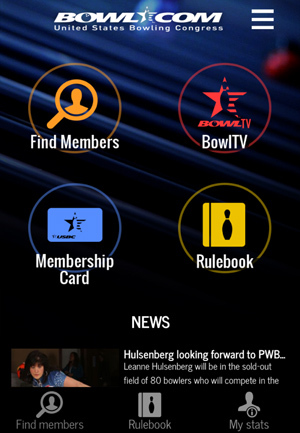 The BOWL.com mobile app only is available to current USBC members. It only is available for Android and Apple phones; it is not available for Windows phones. Please email bowlinfo@bowl.com should you have any questions. If you already have a login ID and password for the BOWL.com website, you can use it for the mobile app. Otherwise, you will need to create a login and password, which is easy to do on the mobile app. The email address tied to your member ID and birth date will populate in the first field, so you simply will need to fill in the Confirm Email, Password and Confirm Password. Once you have filled the fields, tap “Continue”. Please remember the email and password you created can be used to login to the mobile app and BOWL.com website. The Greater Grand Rapids Bowling Council will be hosting the first of 5 events the weekend of September 19 and 20th. The Men are scheduled for September 19th, and the Women are scheduled for September 20th. Pick up your league supplies, at your convenience, on one of these dates. Enter your name into a drawing for a free $18.00 2015-2016 membership. Enter your league’s name into a drawing for a free software update. You must pick up your league supplies to be eligible for the drawings.